BAD HOMBURG VOR DER HÖHE (DE) - Filter cartridges – as well as with every other filter unit - have to be changed in regular intervals. Compared to common fastening mechanisms, Infastaub has significantly simplified this system Life-cycle costs of durable industrial goods, to which cartridge filters also belong, are influenced by operating and follow-up costs. This also includes working time for installation and change of filter cartridges. But filter cartridges – as well as with every other filter unit - have to be changed in regular intervals. Compared to common fastening mechanisms, Infastaub has significantly simplified this system. Because of a special fastening system, the operating personnel can carry out the cartridge change without any tools. For this purpose, the front clamping rail only needs to be unfastened and the cartridges can directly and easily be removed. The filter media change is carried out via the maintenance door on raw gas side, which is an advantage if height is limited. 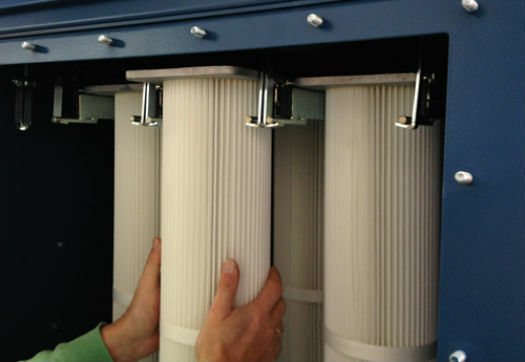 Even the basic dimensions of the filter unit remain the same with the new cartridges.